Recorded in several forms including Allbrook, Albrook, Alebrook, Alebrooke, Allbrooke, Albroke and possibly others, this is an English surname. 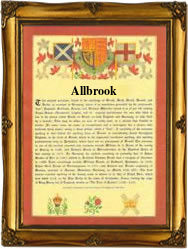 It originates from Allbrook, a now 'diminished' village near the city of Winchester, in Hampshire. The place name meaning is believed to be 'Ealda's broc', with Ealda being an Olde English pre 5th century personal name. 'Broc' in its original meaning was an area of water, not necessarily a stream, and sometimes describing winter floods which created water meadows before drying out in the spring 'Diminished' villages are ones which over the years gradually lost their inhabitants as the requirements for labour reduced. Often they disappeared altogether, in which case they are known as generically as 'Lost medieval villages'. In reality, losses continue all the time through urbanisation and coastal erosion, although not at the moment, through war or plague. Early examples of the surname recordings taken at random include John Allbrook who married Elizabeth Davis at St Margarets Westminster, on July 4th 1585, and Joseph Allbrooke, a christening witness at St Leonads, Shoreditch, on February 5th 1749.